• Legislation looking into rating schools without considering disciplinary actions is being considered by the Education Committee in the Georgia House. In the Georgia House, a new bill has been introduced, which would allow school teachers and administrators to utilize discipline in schools without having it negatively impact their school's climate ratings. House Bill 179 was introduced to representatives by Rep. Colton Moore, R-Trenton, who was sworn into office on Jan. 14. Others in support of his bill include Reps. Ken Pullin, R-Zebulon; Emory Donahoo, R-Gainesville; and Steve Tarvin, R-Chickamauga. Currently, discipline measures such as suspensions, alternative school assignments and expulsions are negatively reflected back on the success of the school, which indirectly encourages teachers and administrative staff to report far less discipline issues due to fear of their school's score dropping. The legislation aims at taking away disciplinary actions from being a factored in a school's Star Rating, which is presently based on attendance, safe and substance free ratings, climate perception, test scores, anonymous student reports and discipline reports. When proposing the bill, Moore said discipline creates a "safe, positive working environment" for Georgian schools, and that teachers must be able to manage behavioral issues without fear of negative consequences. "Removing the ability to promptly enforce a school's code of conduct creates a chaotic environment," Moore said. "Discipline is the solution, not the problem." According to a press release from the House, statistical information shows that this bill would have more of an impact on elementary schools' ratings, where students are still developing patterns within education and learning how to behave best within a classroom setting. Middle and high schools would be less impacted by the change. Calhoun City Schools' Superintendent Michele Taylor said she already sees several issues with the formula used to rate schools to determine their CCRPI – College and Career Ready Performance Index – scores. She said in her opinion, a school's rating doesn't always paint an accurate picture of what's happening within a school. "It is difficult to ascertain whether there is consistency in data reporting from one school to the next across the state," Taylor said, adding on that there are many ways to determine a school's rating outside of the already existing formula. "HB 179 brings light to the fact that additional changes may need to be made in the school climate rating formula and that we need to be careful not to judge a school based solely on this rating," she said. Taylor also said that while all CCS schools had a five star rating last year on the CCRPI, with regards to positive behavior and attendance records, the district is still aiming to improve the school environment at each campus. The Calhoun superintendent also said the district will continue gathering and providing the most accurate information when reporting discipline to the state and the local community. If HB 179 is passed, Taylor said she "does not feel it would impact CCS in a negative way." Gordon County Superintendent Susan Remillard said HB 179 could positively benefit county schools. "I do believe H.B. 179 would help increase each school's Star Rating because currently when discipline is reported it could potentially lower the school's rating depending on the severity of the discipline," Remillard said. "Should it pass it will be very interesting to follow the impact it could have moving forward." This bill is entering the House Education committee, which is chaired by Rep. Rick Jasperse, R-Jasper. For this issue to be seriously considered by the committee for further action, Jasperse is requesting feedback from Georgia's teachers, school principals and administrative staff. To learn more about the bill, visit Moore's website disciplinebill.com. To contact Jasperse, call his office at 404-656-5943 or email him at rick.jasperse@house.ga.gov. • During their basketball event, Special Olympics' staff, parents and volunteers support athletes with special needs as they participate in relays, games and dribble practices. Nika Bolhuis, Adrian Villalobos and Steven Wilson smile after receiving ribbons for placing in the Special Olympics basketball event on Friday. Steven Wilson shoots and scores during the Special Olympics basketball event on Friday. 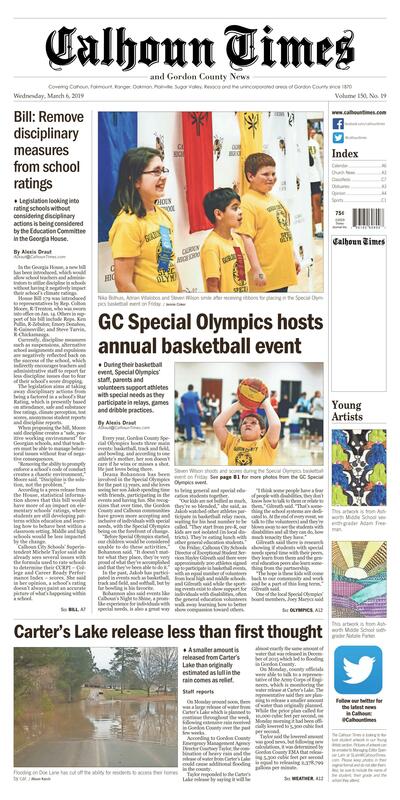 Every year, Gordon County Special Olympics hosts three main events: basketball, track and field, and bowling. and according to one athlete's mother, her son doesn't care if he wins or misses a shot. He just loves being there. Deana Bohannon has been involved in the Special Olympics for the past 13 years, and she loves seeing her son Jakob spending time with friends, participating in the events and having fun. She recognizes that over time, the Gordon County and Calhoun communities have grown more accepting and inclusive of individuals with special needs, with the Special Olympics being on the forefront of change. "Before Special Olympics started, our children would be considered unable to do these activities," Bohannon said. "It doesn't matter what they place, they're very proud of what they've accomplished and that they've been able to do it." In the past, Jakob has participated in events such as basketball, track and field, and softball, but by far bowling is his favorite. Bohannon also said events like Calhoun's Night to Shine, a promlike experience for individuals with special needs, is also a great way to bring general and special education students together. "Our kids are not bullied as much, they're so blended," she said, as Jakob watched other athletes participate in basketball relay races, waiting for his heat number to be called. "They start from pre-K, our kids are not isolated (in local districts). They're eating lunch with other general education students." On Friday, Calhoun City Schools Director of Exceptional Student Services Hayley Gilreath said there were approximately 200 athletes signed up to participate in basketball events, with an equal number of volunteers from local high and middle schools. and Gilreath said while the sporting events exist to show support for individuals with disabilities, often the general education volunteers walk away learning how to better show compassion toward others. "I think some people have a fear of people with disabilities, they don't know how to talk to them or relate to them," Gilreath said. "That's something the school systems are dedicated to. At the end of every event, we talk to (the volunteers) and they're blown away to see the students with disabilities and all they can do, how much tenacity they have." Gilreath said there is research showing if students with special needs spend time with their peers, they learn from them and the general education peers also learn something from the partnership. "The hope is these kids will come back to our community and work and be a part of this long term," Gilreath said. a lot of students who start off as volunteers end up going into careers related to special needs, including physical/occupational therapy or special education. "And a common thing at these events is everyone's going to have a smile on," Marycz said. Special Olympics is an international nonprofit sports organization that connects athletes with intellectual disabilities to coaches, volunteers and workers. In 2018, the movement celebrated its 50th anniversary, noting that it now consists of over 5 million athletes, 1 million coaches and volunteers, and 100,000 competitions yearly in over 170 countries. On Friday, the Gordon County Special Olympics basketball events took place at the Calhoun High School gymnasium. Though locations for the yearly events rotate, the year-round sports training and athletic competition remain consistent for participants. Students from both Calhoun City Schools and Gordon County Schools were represented last week, as well as district staff and volunteers. Gilreath said on behalf of the local Special Olympics charter that she would like to have more public involvement and that they are always accepting volunteers from the Calhoun/Gordon County community. For more information regarding upcoming events, visit the Gordon County Special Olympics Facebook page. • A smaller amount is released from Carter's Lake than originally estimated as lull in the rain comes as relief. Flooding on Doe Lane has cut off the ability for residents to access their homes by car. A road closed sign is up on Doe Lane after a portion of the road flooded from recent rains. On Monday around noon, there was a large release of water from Carter's Lake which is planned to continue throughout the week, following extensive rain received in Gordon County over the past few weeks. According to Gordon County Emergency Management Agency Director Courtney Taylor, the combination of heavy rain and the release of water from Carter's Lake could cause additional flooding in the county. Taylor responded to the Carter's Lake release by saying it will be almost exactly the same amount of water that was released in December of 2015 which led to flooding in Gordon County. On Monday, county officials were able to talk to a representative of the Army Corps of Engineers, which is monitoring the water release at Carter's Lake. The representative said they are planning to release a smaller amount of water than originally planned. While the prior plan called for 10,000 cubic feet per second, on Monday morning it had been officially lowered to 5,300 cubic foot per second. Taylor said the lowered amount was good news, but following new calculations, it was determined by Gordon County EMA that releasing 5,300 cubic feet per second is equal to releasing 2,378,799 gallons per minute. The director also said the release could potentially bring creek and river levels up. As of Tuesday morning, the Oostanaula River was observed to be at 21 feet and is reported to be at minor flooding levels at a location behind the city's water treatment plant off Mauldin Road. "While local rivers have recovered slightly from their highest points last week the release of water from Carter's will certainly have an effect on them," said the director in response to the water release. "We are thankful for the good news of a smaller and more controlled release. Public safety and public works will continue to monitor the situation as it evolves." Looking forward, Taylor said rain should stop for a majority of the week, which might help recede some of the flooding. "According to the National Weather Service while it will be colder this week than we have been experiencing, the good news is that rain should stay out of the forecast until Friday, which will help us to dry out some," Taylor said on Monday. "However, it does look like another rainy weekend ahead of us at this time." As of the start of the week, there were still a number of roads closed due to flooding, including Beamer Bottom Road, Langford Road, Doe Lane, Miller Ferry Road, Sam Hunt Road, Mauldin Road and Erwin Church Road. Many other roads have cones placed for one-lane blockages. Alison Karch, a resident of 132 Doe Lane, has reached out Gordon County Public Works in an attempt to see what can be done about the flooding in a low-point on her road, which has cut off access by car to several homes in her cul-de-sac and limited access to her own home going on two weeks. Karch said when it usually rains a "pond" forms in her and her neighbor's front yard as well as a wooded lot across from her home. But with recent rains, starting around Feb. 21, flooding has worsened and the edge of the water has spread further into the two yards and driveways. After calling public works on Feb. 26, to make sure they knew about the flooding on the road, a "road closed" sign was put up on Saturday, Karch said. "It's not going anywhere, it's standing water," Karch said. "There's about nine houses on our cul-de-sac that are being affected by this, and it's like we pay property taxes just like everybody else. And, once again, I know it's not urgent. But waters from rivers go away. This water is not going anywhere." Karch has continued her communication with public works and county officials, but said she has been told there isn't a viable solution for either removing the water or putting a fix in to ensure this situation does not happen again. "I live on Doe Lane and was advised by someone in your office last week that you had been out to look at the flooding problem and that there was nothing that could be done," Karch wrote in an email to Steve Parris, the director of Gordon County Public Works. "I was also informed that there was nothing that could be done after the water receded to prevent this from occurring again." Also in her email, Karch expressed concerns with residents not being able to drive up to their homes (they park before the water and walk up to their homes), mail has not been able to be delivered since Feb. 22 and kids heading to the bus stop have to trek around the water through yards to get there. Karch said she plans on attending the March 19 meeting of the Gordon County Board of Commissioners to share her frustrations. Calhoun and Gordon County public safety and public works departments will be monitoring the road conditions as well as the Carters Dam release and will post updates as they become available. The residents are asked to not drive through water over roads and never go around barricades that are put up for protection. According to the National Weather Service, the high for today is predicted to be 44 degrees with a low of 24 degrees. Thursday's high is expected to be 54 degrees with the temperature dropping to 39 degrees, with a 30 percent chance of showers Thursday evening. Friday is expected to see a high of 56 and a low of 47 with a 50 percent to 60 percent chance of rain throughout the entire day. Managing Editor Spencer Lahr and Staff Writer Alexis Draut contributed to this report. This artwork is from Ashworth Middle School seventh-grader Adam Freeman. This artwork is from Ashworth Middle School sixth-grader Natalie Parker.